I love the distressed look of white wash. In Bachelorette Pad Flip #1, the fireplace was super dark (and dirty), and I opted to paint it a pristine white. In this house I’ve chosen more distressed elements, and I knew a pristine painted fireplace wouldn’t complement the distressed floors. 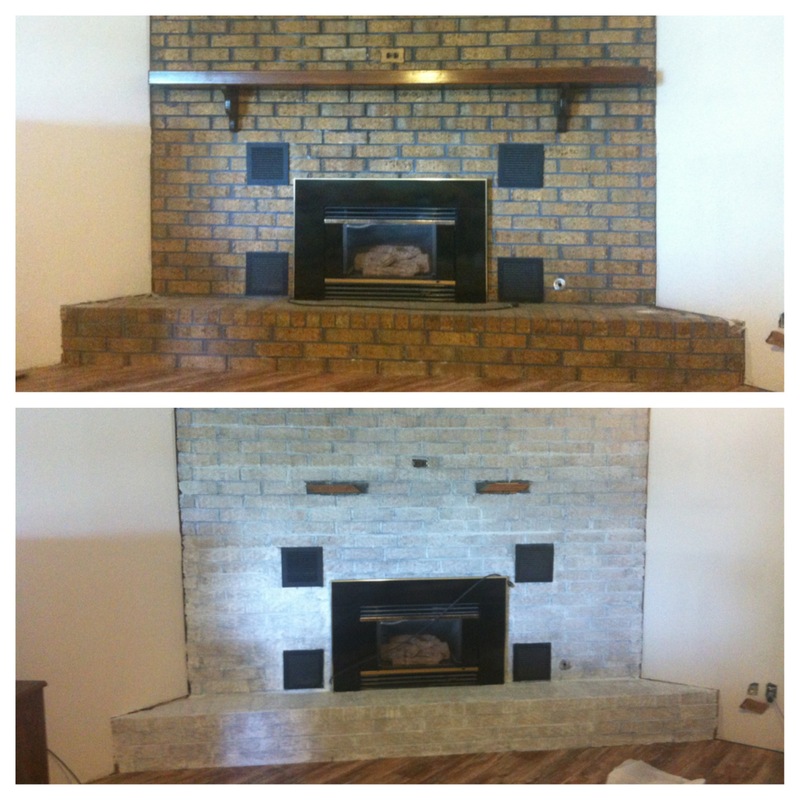 So I chose to do a white wash on the brick fireplace. 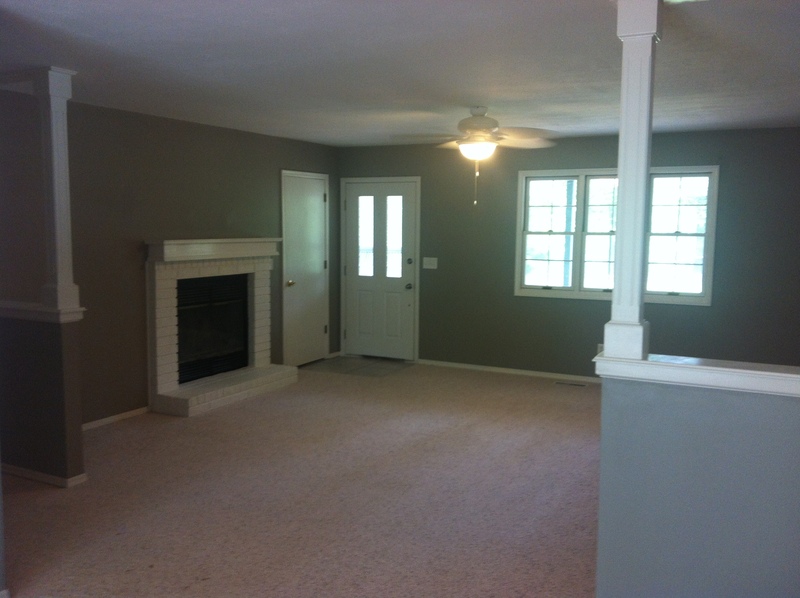 In this photo from Bachelorette Pad Flip #1, pristine white matched all the white trim and lighter elements. Painting a fireplace a pristine white is a very easy process. 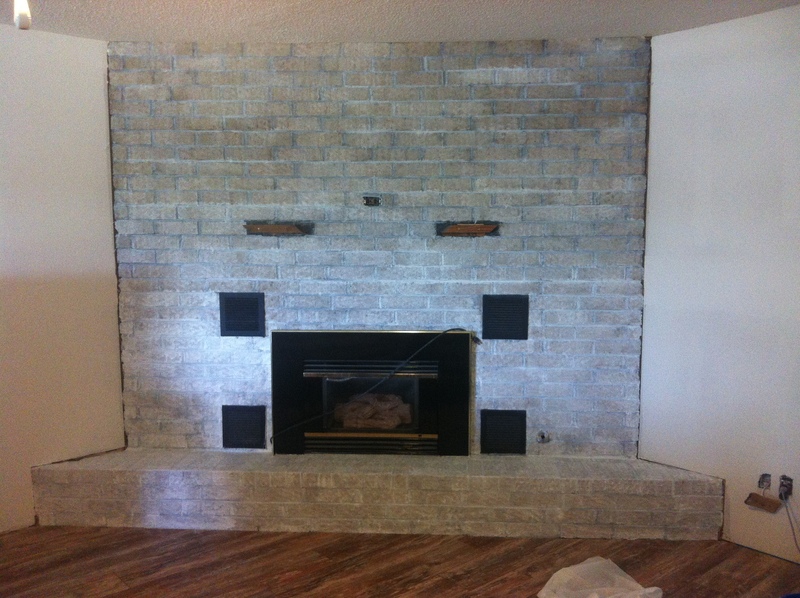 Whitewashing a fireplace is even easier! I have a rather large fireplace and hearth, and it did not take the entire gallon. 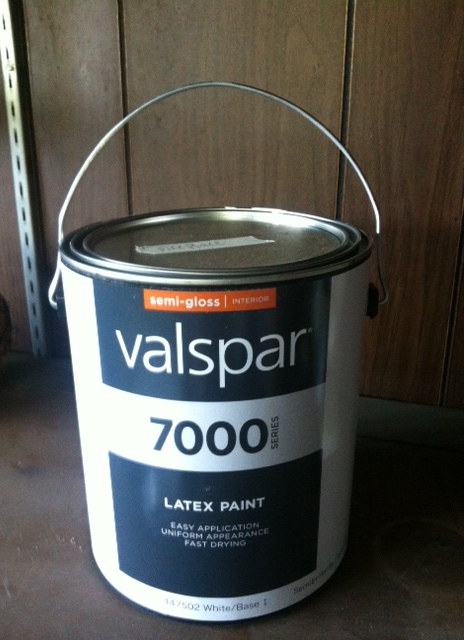 I suggest buying an empty paint can that they sell at Lowe’s that way you can store your excess whitewash. To create the white wash mixture, mix approximate 3:1 paint and water. It’s not an exact science, but it is important to have more paint than water in the mixture. 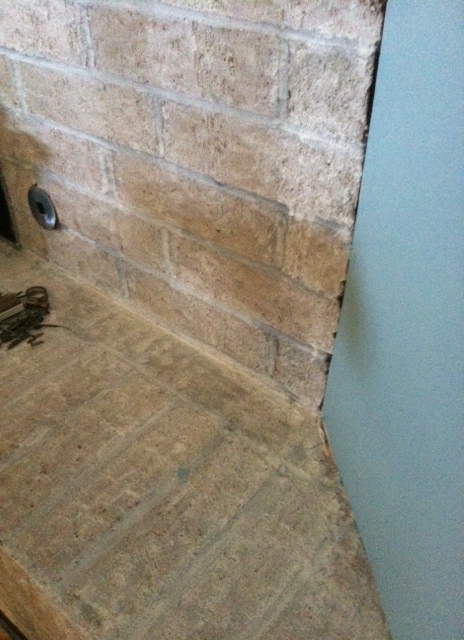 To apply the whitewash mixture, I suggest NOT using a sponge roller (even a sponge designed for brick). Instead, use a heavy-duty bristle brush. The first coat will hardly make an impact; however, I painted two coats and reached the desired results. In order to contrast the whitewash and the wood grains in the floor, I am keeping the mantel the same color (I just haven’t hung it back up yet). Since the walls have now been painted a High Noon blue, the fireplace stands out even more. I love it! The entire process took a little over two hours. 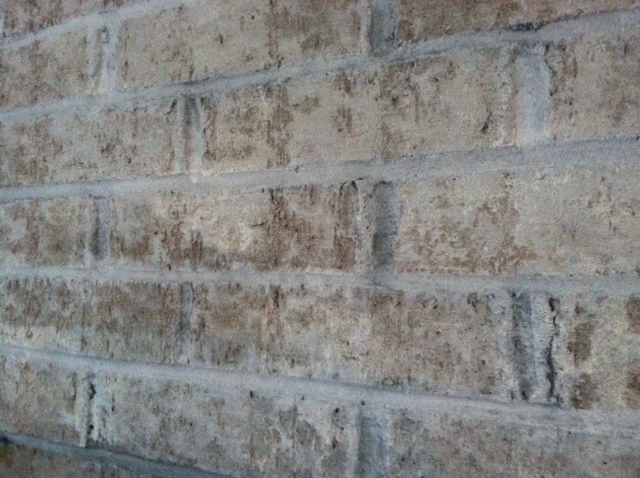 I could have done a third coat to further mask the creamish bricks, but I liked the color showing through. It mimicked the floors well. Great job and a super improvement! My fireplace is wood burning and has red brick but has burnt looking brick from the smoke, how do you clean it off before painting it? I love what you did on he whitewash. Hi Carol! I used a steel grill brush and some soapy water to thoroughly clean. It took several different attempts to get mine pretty clean! 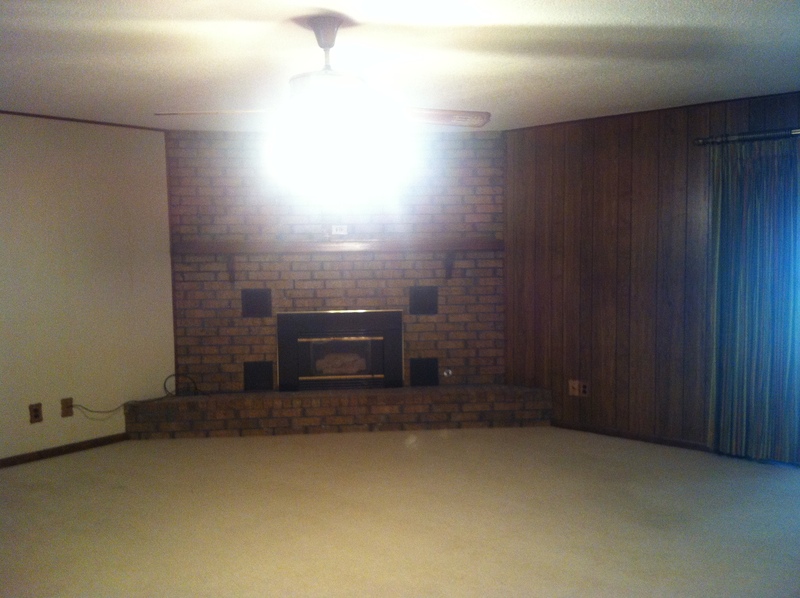 I have an off-white brick fireplace. The bricks are not flat, they are dimensional. Do you have any suggestions on how I can clean them? The whole wall is brick. The best method I’ve found is to use some soapy water and a wire grill brush to scrub. It might also help to use some spray cleaner directly on the bricks while srubbing. YOU DID A PROFESSIONAL JOB INDEED!!! Yay! Glad it helped. Good luck on your project! Hi there! Someone in my Facebook group shared this website with us so I came to check it out. I’m definitely loving the information. I’m book-marking and will be tweeting this to my followers! Outstanding blog and brilliant design.